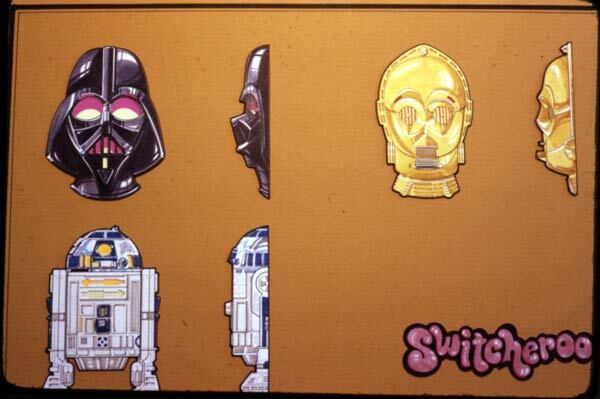 Here you see some conceptual artwork for the line of Switcheroos (figural light-switch covers) that Kenner released in their line of ESB products. The first image depicts artistic renditions of the three pieces included in the line-- ones representing R2-D2, C-3PO and Darth Vader. There isn't much to say about them, other than that I love the font in which "Switcheroos" is written at the bottom of the illustration board. I think that font was outlawed in 1979 by the Board for Aesthetic Reform During the 1980s. This second illustration is much more intriguing. 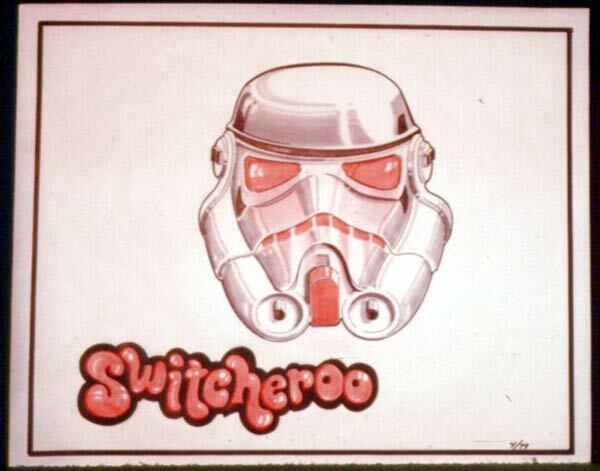 It depicts a Stormtrooper Switcheroo, a product that was never produced. Too bad, too, because I think it would have been the coolest one of the lot. Unfortunately, none of the items seen in these photos are known to currently be in existence. These images come from a batch of slides unearthed by Chris Fawcett, web master of 12back.com.